There is something moving and inescapable in the similarity between the two words ‘Icaro’ - the shamanic singing tradition of Peru, and ‘Icarus’ - the subject of the ancient Greek myth about the man who flew too close to the sun. It is as if there were a connection between Icarus, inebriated by his flight, high in the skies upon his waxed wings, and the magical shamanic songs, which go high into the spirit world. But there the parallel stops. Icaros (or Ikaros) are the magical tunes or lyrics - which may be sung, whispered or whistled - by shamans (and sorcerers alike) in Peru, to communicate with the spirit world. The word possibly derives from the Quechua verb Ikaray - ‘to blow smoke’ a technique used by shamans in their healing. Shamans use these melodies to magically charge a person, a plant, or virtually anything else - whether animated or unanimated - with a specific intent or purpose, to obtain or influence a desired outcome. They represent a special language intended to interact with the spirit world, including - but not limited to - the plant spirit realms. The traditional way by which shamanic healers in the Peruvian Amazon learn - or better still, receive directly from the spirits - their icaros, is through a regimen of diet (la dieta). The shaman receives the tunes whilst they are asleep, dreaming, or in vision - whilst journeying in the spirit world intoxicated by ayahuasca, or during the plant diet. The shamanic diet imposes physical isolation in remote jungle areas (monte) away from people, and a strict celibacy and abstinence from certain foods (pork, chilli, spicy food, fats, meat from farmed animals, salt, sugar, most vegetables and fruits) too, as well as an avoidance of alcohol, canned food, and chilled and fizzy drinks. The rigours of the traditional diet in fact only allow for certain river fishes, rice and green plantains (boiled or roasted) to be eaten, all unseasoned. The contact with the spirit world is therefore achieved thanks to a diet that - in common with other religious, esoteric, shamanic and spiritual traditions - also entails sexual abstinence and isolation. During the diet the shaman (as well as the apprentice shaman) ritually ingest different brebajes (beverages) of plantas maestros (teacher plants) and palos maestros (teacher trees) in the form of teas, made from the resin, leaves or scraped stem of plants and trees, and, or macerates (from the scraped bark or roots of trees), alternating this with the taking of ayahuasca. The choice of the plant teachers to diet with, as well as the interaction between the plants and trees of the diet with ayahuasca (which is usually taken on different days to the brebajes) will vary from shaman to shaman. This is because many shamans receive their instruction for how to proceed with the diet in vision from the plant spirits themselves. The diet is therefore the main method used by the shaman for learning, advancing and progressing in their knowledge of the plant spirit world, and receiving powers. Contrary to what is commonly believed - with the exception of ayahuasca and a few other plants such as one called toé - the plants of the diet do not usually have an intrinsic psychotropic, mind-altering effect. Visions occur by a synergetic interaction between the diet’s setting and the plants of the diet, which are naturally complementary to each other. This is the framework within which the shaman operates, and it is of paramount importance to be aware of this in order to understand the process of the diet and - consequently - that of the origin of the icaros. There are three levels of high shaman in the Peruvian Amazon, the banco, the sumiruna and the Muraya. A banco, is a master shaman who has dominance over the jungle and sky realms, they specialise in diagnosing, healing or divining after they have entered into trance, face-down in their mosquito net. A sumiruna can access and master all of the jungle, sky and water realms. A muraya is a shaman who can access the sub-aquatic realm, having control over the water spirits (yacurunas) mermaids and river dolphins). They learn this from aquatic trees, plants and vines. A muraya is also a master of the earth (jungle) realms too. Among the murayas, there are also the allpa muraya (muraya of the earth) who specialise in mastering the spirits of the earth, the huayra muraya (muraya of the air), who have mastery over meteorological phenomena such as thunder, wind and rain. These are different to the alto muraya (muraya of the sky), who are masters of the spirits of the sky - heavenly spirits, dwelling in space, and on other planets and constellations. To confuse things further, one could also be a banco muraya. These are shamans who have knowledge of, and dominance over, water plants and spirits, as well as the spirits of the earth. I myself have studied with a French Curandera Ema'a Drolma Mata and now I've found my new maestro in Don Juan Flores from the Mayantuyaca centre. Icaros serve several different purposes. There are some used specifically for healing or love magic, while others are used in shamanic apprenticeship and initiations (dieta chamanica). Some are used specifically at the point of ending the shamanic diet (icaros por la quebra de dieta), others for spiritual purification (icaros de purificacion espiritual), to cleanse, bless and protect people (el canto de la Arkana por la protecion), to close a shamanic treatment (para finalizar un tratamiento), and there are even icaros to overcome the intoxication caused by ayahuasca (icaros para superar el senso de mareacion). The shamans of the Peruvian Amazon also have a concept which they call the arkana. This is an invisible energetic protection - which may be given by stones, crystals, angels, rainbows, plant teachers, spirit allies of animals like the jaguar, the eagle, the condor, or other entities - engaged by the shaman for a variety of purposes, especially during ayahuasca ceremonies. The arkana is used by the shamans themselves, first of all for their own protection, then for the protection of the participants (apprentices and patients) taking part in the ayahuasca ritual, in order for all to be shielded from potentially malevolent attacks from brujos (witches), competing shamans, or evil spirits. I can call for the good spirits to come. as a whirlpool and enter with power inside your body. I want this whirlpool to rise above you, to be strong. may not take it away from you. I call my spirit protector. poder) from the spirit world. Shamans sometimes sing ‘autobiographical icaros,’ icaros sung by some maestros and maestras (female shamans) to demonstrate how powerful they are as healers (medicos). Specific icaros are also sung over plant brews (el brebaje) while they are being prepared by the shaman. The brew could be either ayahuasca or other concoctions prepared with other plant teachers such as remo caspi (aspidosperma excelsum), toè (brugmansia suaveolens), or chullachaki caspi (brysonima christianeae) as part of the shamanic diet. In this case the icaros are usually softly whispered to the plant medicine, and are used to charge it with positive energy and protection. especially true of the ayahuasca medicine, which has a very proud, indomitable spirit. Other icaros are used to announce an exciting journey in the spirit world, when new plant teachers are discovered during the intoxication with ayahuasca. for the spirits’ help, they may then begin their treatment. The icaros sung by the Shipibo- Conibo shamanic healers are very different from the icaros of shamans belonging to other ethnic groups, and are especially different from the mestizo (mixed race) healers, generally of Spanish- European decent. Shipibo icaros always bear the distinction of a changing of the voice or vocal pitch, often alternating between a strong, masculine tone and that of a more delicate, high-pitched, feminine like tone. This is known as the ‘dual choir’ singing style, and for the Shipibo shamans it is a specific way to communicate with the feminine spirits. The spirits are not only invoked by singing this way, as, by through this vocal technique they are also able to directly enter the ceremony and communicate with - and via - the Shipibo shaman, by using the shaman’s own voice. This dual choir style is one of the most important elements of distinction between Shipibo icaros on one side and all other icaros on the other. By listening to Shipibo icaros it is clearly evident how the shaman is engaged in an open conversation with their spirit helpers - including the ever present spirit of the ayahuasca vine Nishi Ibo. The shaman lends their voice to the spirits, and as reported by Shipibo shaman Don Leoncio, a feminine spirit teacher may appear or may be summoned during an ayahuasca ceremony, and when this happens he is compelled to sing in the same fashion as this spirit. The shaman has to shape shift into the spirit whilst it is transmitting its powers. ceremony, when the melodies and tunes engaged by the shaman can literally drive the otherworldly journey of a participant along the precise pathways of a mapped visual - and visionary - landscape. This is especially true of Shipibo icaros, which may be seen in a visual way through the intricate luminescent designs (quené) of the Shipibo people themselves. These designs are reminiscent of phosphenic visions, and are deeply embedded with Shipibo cosmogonic and cosmological motifs, and they can be perceived in an acoustic, auditory way by people under the influence of the spirit world or held within the effects of ayahuasca. 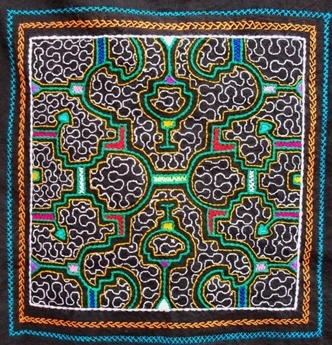 Shipibo designs express the compelling need to bring the cosmic, heavenly order down to earth, to bring order into chaos, to re-establish harmony. To the Shipibo, the entire universe has three cosmic regions - the upper world, which is represented by the great Sky Serpent (the Milky Way) - the world around them where we live in the everyday - and the underworld. For the Shipibo- Conibo these three cosmic regions are made of, and covered by quené designs, closely interwoven, constantly emerging, merging and incessantly shifting from the invisible to the visible realms. Their shamans act as interpreters, and are the focus of the relationship existing between medicine, the cosmos, quené designs and music. Intoxicated and illuminated by ayahuasca, they are capable of accessing the different realms of creation, communicating with spirit beings and navigating through the upper, middle and lower worlds. During an ayahuasca ritual, tobacco smoke, scented water and perfumes, and visionary quené designs (turned into magical lyrics as icaros), are the key tools of the healing method employed synesthetically - in an audio, visual and olfactory sensorial way by the Shipibo shaman, to bring about healing in the patient. Even without (and independently from) ayahuasca and tobacco smoke, this uniquely intimate relationship between icaros, quené designs and shamanism can be seen when we look at the most powerful of the Shipibo-Conibo shaman-mythic beings of olden times, the Meraya. This being was reputedly capable of becoming invisible, of being in two places at once, of shape-shifting into animals and of traveling to other dimensions. The Meraya - as the legend goes - entered into trance inside his mosquito tent for women of the Shipibo tribe, to help them to create designs. In trance, the Meraya received a visit from the various spirits, and these are said to have painted their designs onto strips of tree bark, or else to have ‘sung’ the designs themselves. The Meraya then tried to memorise these songs, imitating the spirit melodies in the form of whistles. As soon as the spirits left the mosquito tent, the Meraya attempted to draw these magical songs, bringing them down from the encrypted invisible realm of the spirit melodies, to the visible realm of the designs. This legend speaks of - or at least hints at - a relationship existing between the icaros - the magical melodies and the quené - the magical designs of the Shipibos. The Meraya learnt the melodies and designs (synesthetically erceived as ‘seen and heard’) he received from the spirit world, and transferred them to the visible, worldly plane. So, in a way, the icaros served the purpose of codifying the magical quené designs, which are said to have - in turn - powerful spirits like the hummingbird (Pino Heua), the anaconda (Ani Ronin) and the ayahuasca spirit (Nishi Ibo) as their masters. This relationship, of ayahuasca, shamanism, music and visual designs, together with the dual choir vocal technique, remains unique to the Shipibo-Conibo. A further distinctive mark of Shipibo shamans, is the way they conduct their ayahuasca ceremonies. These are held almost always without the generally present shacapa fan. The shacapa is a musical rattle, made from the leaves of certain plants (or, in some cases, bird-feathers), which is used almost everywhere else in the Amazon as accompaniment to the singing of icaros, and to clean away negative energies. The icaros - whether used for healing, cleansing, protection, love magic or doing harm - have power. They are not just songs, they are magical tunes. More research is needed if we are going to unravel the mysterious relationship between icaros and the other important aspects of Amazonian shamanism, as all are inextricably linked with the Amazonian shaman, versed in communicating with the spirit world along precise, coded musical pathways - conveyed - in the Shipibo world, in musical designs. When I first heard an icaro about 12 years ago, I was immediately enchanted. I was a musician myself but had not yet discovered my own voice. I subscribed for a Shamanic training and without realizing it I went into my first nightly plant ceremony. An experience that I still remember vividly to this day. The shaman Ema'a Drolma Mata, was my first Maestra and she initiated me in this magical work with the plant spirits. The Plantteachers turned my whole world upside down and changed my 'direction' forever. The plants create a bridge between the spirit world and our rational world. In itself there is no difference and there is only one. Yet we have chosen to continue to develop our rational side in particular, and in other words to block seeing the whole. Over the years, I also discovered my own singing potential and even started teaching in voice liberation and voice discovery. I learned how to sing the icaros first with Ema'a and later I started going to Peru to receive my most important initiations with Don Daniel Arevalo (shipibo indian). On general request I gave teaching in this special way of singing. Everyone has his / her unique way of making contact with the Nagual or your true pure nature. It is about creating a gap between two worlds, a bridge as it were. If you cross this bridge, you will see differently, clearer and 'know' immediately without any form of knowledge. For me the portal to this 'knowing' was; music and later also the voice. My last trip to Peru in 2018 has put a lot into motion. I met Maestro Juan Flores and started a new learningproces with him. The work at the site of the Maestro and then continuing the diet with the different plants have make the big jump to work as a curandero. A path of profound personal healing for myself, a way inward, keeping focus and containing personal strength. I am grateful for the powerful softness that I now observe deep within me. From this feeling I can no longer bring the sessions as before. I already noticed that the singing circles, workshops, etc., started to look more like small ceremonial evenings. So the turnaround had already begun.